From communicators and tricorders to warp drive and teleportation, the fantasy of Star Trek has slowly evolved from science fiction to scientific reality in the last few decades. Such is the impact of positive entertainment in inspiring young, innovative minds to develop the technology of the future and reshape our every day lives. Back in the 1960s, a relatively unknown producer called Gene Roddenberry had a tough time convincing Hollywood television moguls about a conceptual science fiction show. During this turbulent period in 20th century history, the Vietnam War was in full swing and the Cold War was spreading fear and hostility between the U.S. and U.S.S.R. It wasn’t uncommon for the average person to escape reality through the idiot box. Sitcoms and adventures were venerated through shows such as I Love Lucy, I Dream of Jeannie, Bonanza, Mister Ed, Hogan’s Heroes, Dragnet, Get Smart and the slapstick Batman episodes that dominated television. A few shows, such as the The Twilight Zone, stood apart from mainstream television for its suspense, eeriness and some horror concepts. There was My Favourite Martian but that, too, leaned towards comedy with no science. There was also the impeccably silly Lost in Space, about a boring family who, erm, get lost, rather than do anything with space itself. Although successful, the show couldn’t quite decide what it was about: part tacky comedy, part Gilligan’s Island and all bickering family drama. Unsurprisingly, it inspired no modern technology and not even its bucket-shaped robot was emulated except for Comic-Con appearances. Something dedicated purely to science fiction and space exploration with a multi-cultural and controversial mix of international crew members was too farfetched for its era. Only an intellectual with the audacity of an explorative mind could imagine themes with far-reaching and preposterously awesome consequences. Enter Roddenberry, who could boldly take us where no television producer had taken us before. Flash forward over half a century later and life without Star Trek appears unimaginable. Three seasons of the original show plus many spinoffs, ten feature films and a reboot later, Captain Kirk and the Enterprise are continuing to spur technological evolution from pure entertainment. If it wasn't for this show, many of today's inventions and gadgets would never exist and humanity's passion for innovation would have taken a beating. The Communicator - Hailing on all frequencies! It was back in the 1990s that Motorola released the first commercial device directly inspired by a Star Trek prop: the flip-open StarTAC cell phone reminiscent of the away team’s communicators. The clamshell shaped device was a huge success and spawned many improved variations over the next decade that consolidated Motorola’s position as a serious technology provider. This continued until Apple’s first iPhone knocked it right off the market and heralded a new era of touchscreen smart phones. The Data pad - Live long and prosper! Imagine an 11-year-old boy back in 1966, watching an episode of Star Trek TOS where Captain Kirk or Uhura write away into a semi-flat digital pad that wirelessly communicated with the Enterprise’s central computer. It’s not too hard to connect the dots about how this lad, almost a quarter of a century later, would launch a fully working version of this device as the iPad we know today. Steve Jobs, another visionary of his era, was able to extract technological ideas from pop-culture and sci-fi, to create realisable, every day objects that change forever the way we interact and consume knowledge. 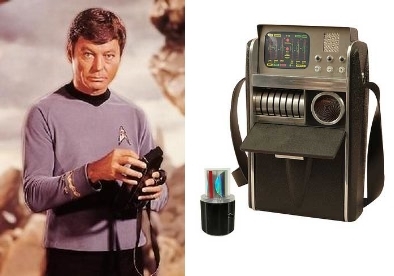 The Tricorder - Damn it, Jim, I’m a doctor! Tricorders are a trickier thing. As opposed to devices which have a single purpose, a tricorder is a hypothetical mobile medical scanner meant to non-invasively diagnose a wide array of bodily functions and injuries. Essentially, a multi-purpose, advanced diagnostic centre in the palm of your hand. Additionally, a tricorder is able to detect the presence of lifeforms and analyse atmospheric composition. So a wee bit more handy than a flashlight and a pocket calculator then. In April 2017, two brothers, Dr. Basil Harris and George Harris, won the $2.5 million Tricorder XPrize contest sponsored by Qualcomm to build the first working prototype. Granted, even though the device is mainly focussing on medical implications rather than inter-planetary space explorations, this could be a game changer for the medical field and consumer healthcare industry. 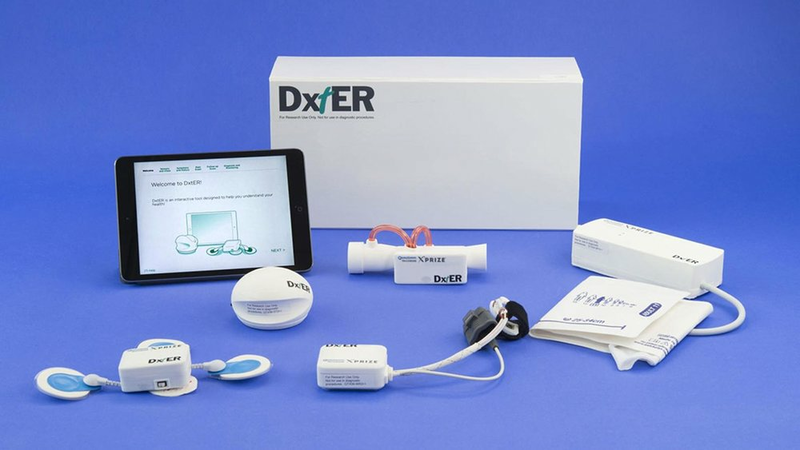 The device, named DxtER, plugs into another Star Trek inspired gadget - the iPad - to diagnose 34 medical conditions such as anemia, urinary tract infection, diabetes, atrial fibrillation, stroke, sleep apnea, tuberculosis, chronic obstructive pulmonary disease, pneumonia, otitis, leukocytosis, and hepatitis. Not bad for a family of Trekkies! The Phaser - Set phasers to stun! Guns and knives were too crude for the advanced civilisations portrayed in Star Trek. Instead, the crew carried phasers; particle weapons with multiple intensity settings ranging between stun and kill. Additional applications included heat and disintegration. While we can’t quite weaponise or shoot particle beams yet, the US Army has built a type of electromagnetic pulse (EMP) gun that blasts out microwave energy. The Raytheon weapon uses high-power microwave (HPM) energy to create an electromagnetic phaser gun and its present application makes it more of an anti-drone warfare tech. Essentially, it causes voltage surges in the enemy’s electronic equipment, causing failure and malfunction. Far from mobile, the actual radiation transmitter sits atop a 20-foot shipping container. The Tractor Beam - Get a lock on that shuttle! Using a kind of gravity beam force field to produce spatial stress around an object, a spaceship or space station could alter said object’s trajectory to tow it towards or repel it away from the source of the tractor beam. Imagine its application in the real world, from construction or hazardous situations, where large objects could be manipulated into position without towing cables, pulleys, hydraulics or even manual interaction. Buildings would be erected quicker and terrorist attacks such as 9/11 could be potentially averted. Physics professor Dr. David Grier is working with NASA to built a real-life tractor beam. Presently, under laboratory conditions, his team is able to move “tiny things very, very small distances,” but their goal is to extend this distance from micro-metres to centimetres and eventually to kilometres. Separately, Asier Marzo from the University of Bristol is working on a sonic tractor beam. Using speakers and ultrasound at a frequency of 40 kilohertz, Marzo and his team were able to levitate very small objects placed directly above the source of the sound. While sound cannot travel through the vacuum of space, Marzo’s innovation has innumerable industrial and medical applications right here on Earth. The Warp Drive - I'm Givin' Her All She's Got, Captain! This elusive technology will perhaps be one of the most sought after in our world for decades, if not centuries to follow and involves a deeper understanding of space-time and the laws of quantum physics. The idea of a warp engine is that space and time are made to distort or ‘warp’ around the spaceship, thus creating a sub-space bubble that enables it to travel ridiculously faster than the speed of light. NASA’s Harold White, a physicist testing these concepts on a much smaller scale at the Apollo program lab, claims that with some exotic matter and special design, a warp-drive enabled spacecraft could theoretically be possible. Similar to how a submarine moves in water, a spacecraft would create quantum-level fluctuations in a vacuum to generate the necessary thrust to move in space. The negative vacuum energy by-product will power the warp-drive engine to achieve speeds of 10 times the speed of light. The best part? As previously theorised in the 1990s, vast amounts of energy wouldn’t be required under White’s model. Exotic mass the size of NASA’s Voyager 1 probe should do the trick. Simultaneously, NASA is working on the electromagnetic (EM) drive; an EM propulsion technology that requires a spacecraft to house an onboard nuclear power plant to generate the energy requirements for faster-than-light travel. It’s all a few steps in the right direction of interplanetary or even interstellar space travel, but don’t pack your bags just yet. The Transporter - Beam me up, Scotty! The legendary transporter technology in Star Trek lore enabled instantaneous teleportation of an object or person from one location to another by converting matter into energy and vice versa. This could radically transform our understanding of traversing distances. The need for planes, trains and automobiles would dive south so dramatically, it will alter our economies and carbon footprint instantly. But is teleportation of living beings even a remote possibility in the near future? Probably not, but photons, yes. Scientists have managed to teleport photons over 95 kilometres of fibre optic cable, re-affirming the quantum physics notion that subatomic particles co-exist in two (or more) places at the same time. In the future, the team hopes to eradicate the use of cables and wires, even though teleportation involves large amounts of energy and a thorough understanding of matter at a particle level. Although we are far from disassembling and reassembling living beings across considerable distances, we are making incredible progress.